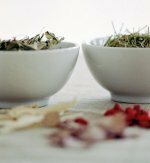 Herbs for pregnancy are very useful to provide additional nutrition to your prenatal vitamins and to treat common pregnancy discomforts like morning sickness, fatigue, and to prevent miscarriages. Herbs for pregnancy also have a nourishing power containing high concentrations of Vitamin A, B, C, and E and the easy to absorb iron and calcium, and other minerals like potassium and phosphorus, very much needed during pregnancy. I would recommend that once you become pregnant you begin switching from FertiliTea to Tea For Two. This herbal bland has been specifically designed for pregnant women to help have a problem free pregnancy and delivery. Among all the herbs for pregnancy, Red Raspberry tea is one of the safest and used as a tonic to strengthen the uterus. It also helps prevent hemorrhages and miscarriages while supporting healthy digestion and preventing morning sickness. A tea made from Red Raspberry provides extra calcium needed for the baby's growing skeleton. This herb also helps you sleep better and relax, helping you reduce stress. Ginger is another great herb for pregnancy, especially for those who experience morning sickness. You can get fresh ginger at your grocery store and slice it up into small pieces, boiled them and then sip the water as a tea during the entire day.